The Johnson Family: Which Princess are you? My friend had this on her blog (Thanks Chex!! ), so I thought I'd try it out since I was in need of a new post. I must say I was quite surprised with the outcome. I wouldn't have guessed I was so "free-spirited." (Or "wise" for that matter!!) Hmm. 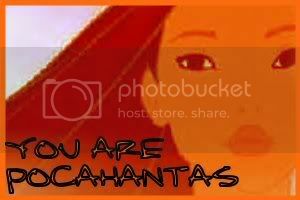 Hey I did the princess test and I was Pocahantas too! Crazy huh? Hope all is well. Love ya! I love you Pooks! I can totally see you as "free-spirited" but I agree with you on questioning the "wise" part...hahahah...we seriously need to hang out! For reals! I need to see you as the cute pregnant lady I know you are! 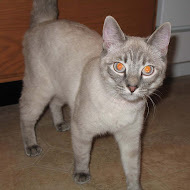 Ok, I guees this is good-bye. I'm going to miss you. I wont be back until Friday night with a really nice tan. I hope. :) Love ya!